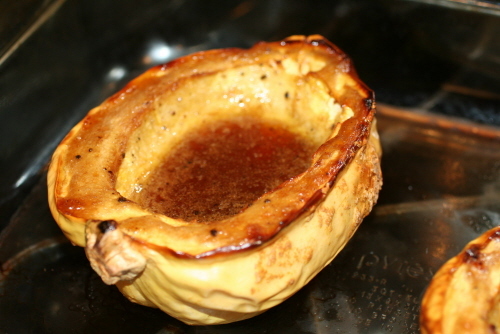 There is nothing that says fall like a delicious baked acorn squash recipe. My house smelled amazing while this cooked. The brown sugar, butter, and maple syrup just filled up the entire house like potpourri. Heavenly! The best part is it only took about 5-7 minutes to even get it prepared to put into the oven. That is definitely my kind of meal. To make this a little more nutrient-rich, I used more natural versions of the ingredients. For example, I used sucanat (a pure version of brown sugar) and 100% Grade B Maple Syrup or honey. Also, please note that most acorn squash is a dark green on the outside. 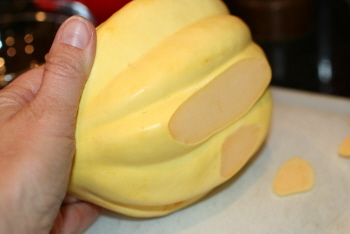 the one I used was called a “blond acorn squash,” named for its golden color. Below the recipe, you’ll find step-by-step instructions and pictures. Enjoy! Combine brown sugar, butter, maple syrup, salt and pepper in a small bowl. Set to the side. Halve the acorn squash, cutting from end to end (at each stem end), then take a melon ball scoop and get the insides with seeds out. Cut a little off the bottom of the squash so it will lay flat in the pan. Pour butter and sugar mixture over the top and inside of both halves. Cover bottom of pan with water, just to keep squash moist and from drying out. Cook in a 400 degree oven for 45 minutes or until soft. 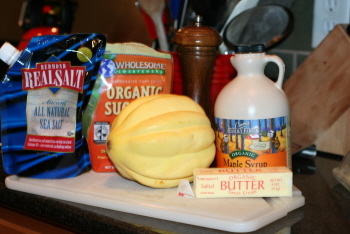 Baking acorn squash is really easy. The hardest part of this is going to be finding a knife sharp enough to cut it in half! Combine brown sugar, butter, maple syrup, salt, and pepper in a small bowl. Set to the side. After you halve the acorn squash, from end to end (at each stem end), then take a melon ball scoop and get the insides with seeds out. Cut a the bottom of the squash so it will lie flat in the pan. Pour butter and sugar mixture over the top and inside of both halves. Cover bottom of pan with water, just to keep squash moist (otherwise, it will dry out). 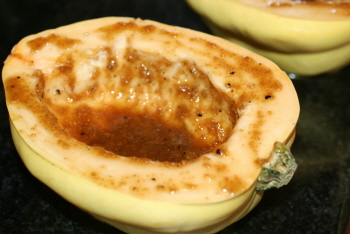 These Faithful Provisions readers had some great ideas for more baked acorn squash recipes. 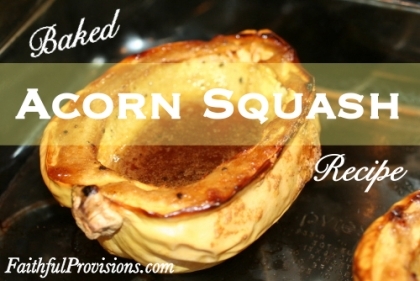 Baking isn’t the only way to cook acorn squash. 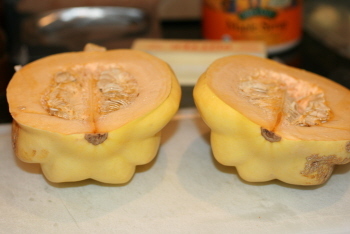 Learn some different cooking methods for acorn squash HERE.